The pictures on this page can be gone to via the links that I put on the page. Each picture is roughly 100KB (at 50% jpeg compression) and are all best viewed under true color, but I viewed them using only 256 colors and the dithering seems to work extremely well. The pictures are also on the "big" side, so you might have to increase your resolution to view them, or shrink them to get a good view of them (they look more fantastic if you can display them at their full size). I scanned these photos using my brother's flatbed scanner. I had to choose the pictures carefully since I only have so much space on my account for storage. I have slightly over 1.5 MBs of pictures linked to this page. The lake has two islands at its center. Both are volcanic in nature, but were created in different ways. The black, dark colored island, is called Negit and is a Volcanoe that is covered in cinders. The whitish, light colored island covered with vegitation, is called Paoha, and it was pushed up from the lake bottom due to rising magma. It has some hotsprings (which I didn't see) on it. The really white colored, flat area is a land bridge that appeared when the level of the lake became low enough to uncover it. 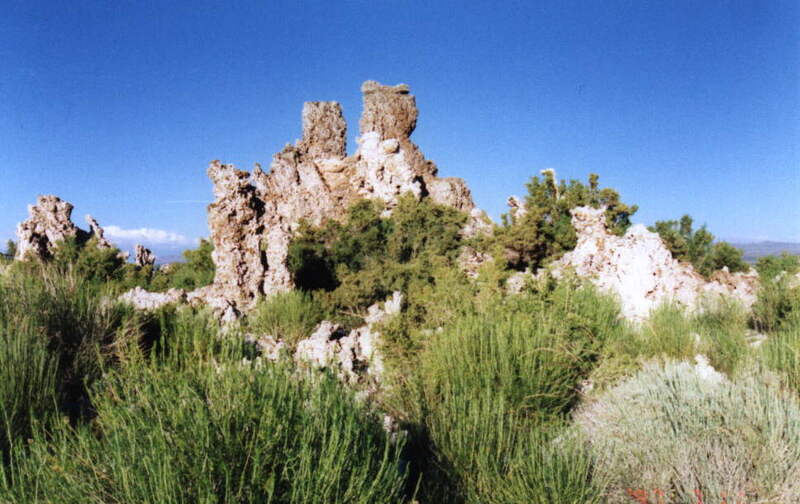 One of the major features of Mono Lake is its tufa. The tufa that everyone regularly sees is the Limestone Tufa which is caused by limestone being created and deposited at places at the bottom of the lake around objects that they can stick to. 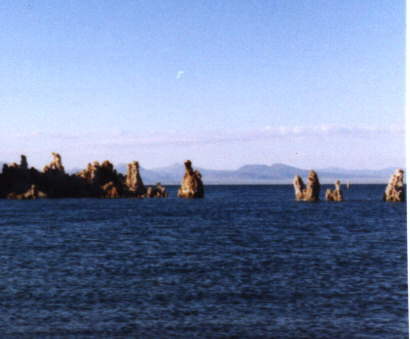 Most of the tufa is created around springs at the bottom of the lake whose chemicals react with the lake's akaline waters to create the limestone. 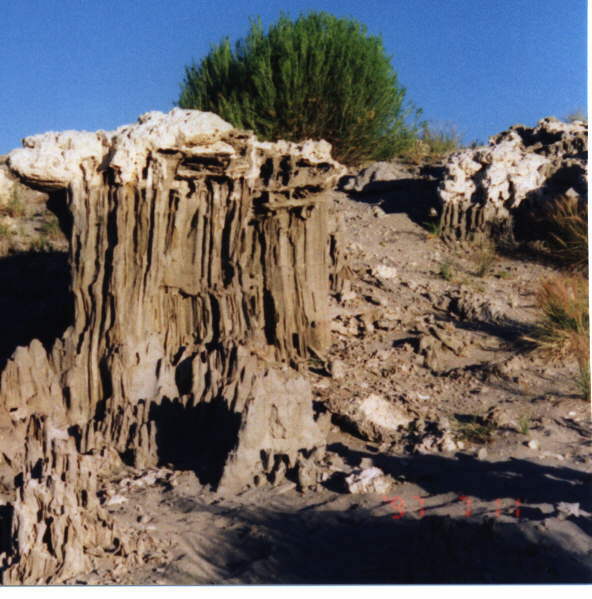 The fly larvae is supposed to have some impact on the creation of tufa as well. 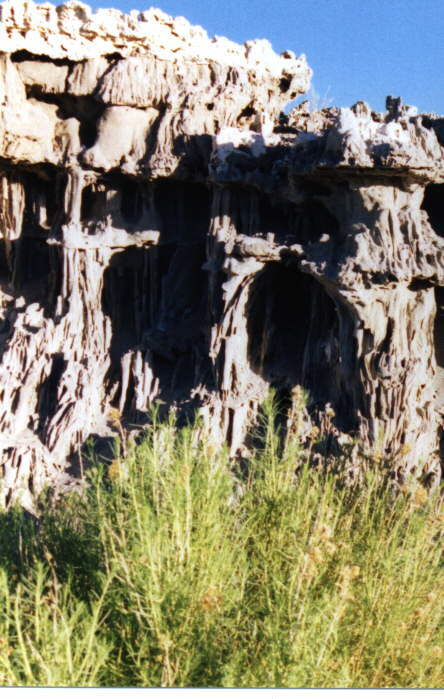 I have fogotten how Sand Tufa is created, but it is formed beneath the lake's bed and can't be seen under normal conditions unless it is uncovered (as it has been when the water dropped from the Los Angeles Aqueduct taking the water the lake needed to stay at a constant level). There is also another type of Tufa which I didn't see (except inside the museum), called Ice Age Tufa, which looked like a bunch of opaque crystals pointing in odd directions. 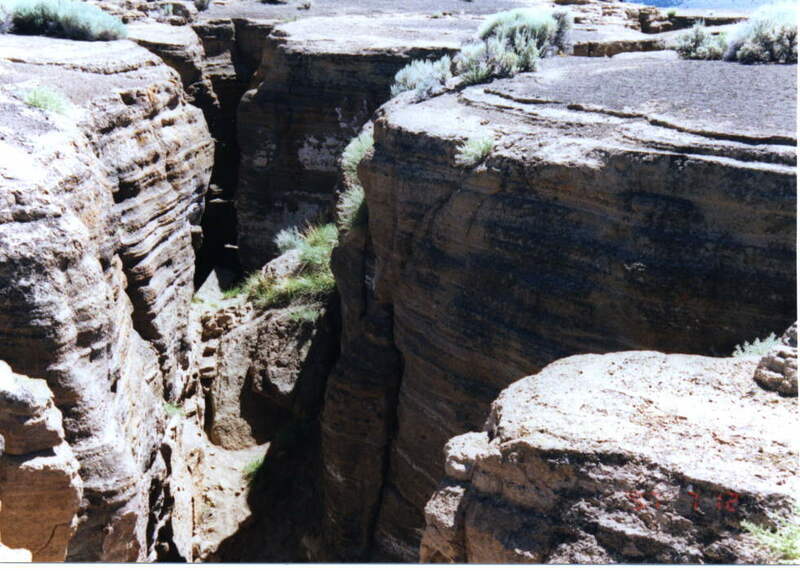 While at Mono Lake, I was able to visit the fissure at Black Point. 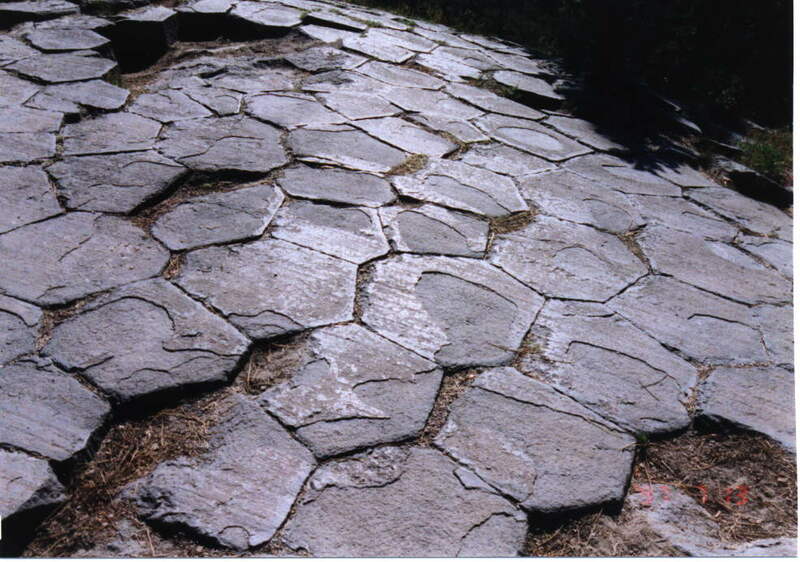 It was created when the entire area was under the waters of an ancient sea. 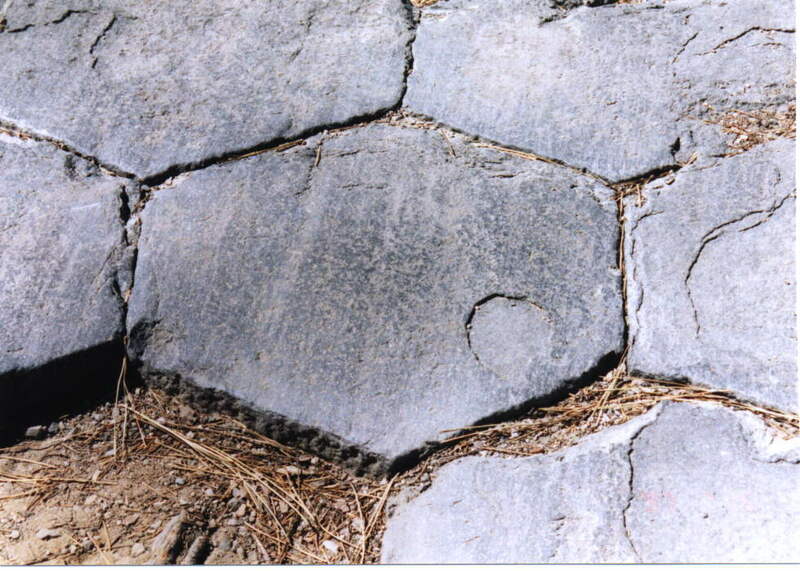 The fissure was created from the lava cooling rapidly, causing the crack to form. At some points the fissure is wide, but there is a long portion where you could just hop over the top of the fissure to the opposite side. It's quite deep too. Mono Lake is now being protected by the government because Los Angeles's Water District was draining the lake dry for their own needs. Now they are required to assure that the lake will rise to a certain minimum level, and will not fall below that level. 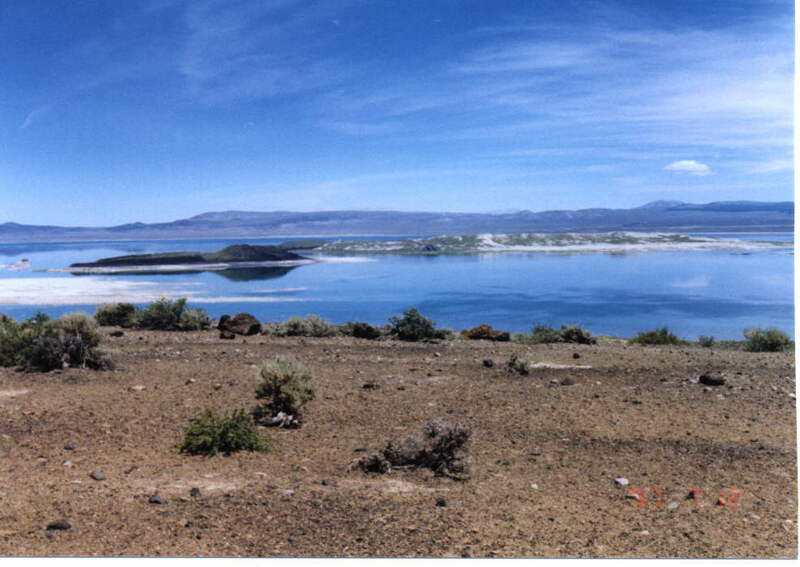 Because Mono Lake has alkaline water of about pH 10 and about 3 times the saltiness of the ocean, the Los Angeles Aqueduct takes the water from the rivers and streams that feed Mono Lake, and the water evaporates from the lake since there are no outlet streams or rivers. Another lake that doesn't exist anymore because of the over draining of lake sources is Owens Lake, south of Lone Pine, California. The sediments from the bottom of Owens Lake's bed are stirred from winds and give Lone Pine one of the worst air qualities in the entire United States. I think Owens Lake has even been renamed to Owens Dry Lake by some since it just doesn't get any or enough water to be anything but a lake bed. The Devils Postipile is an extraordinary place to visit. 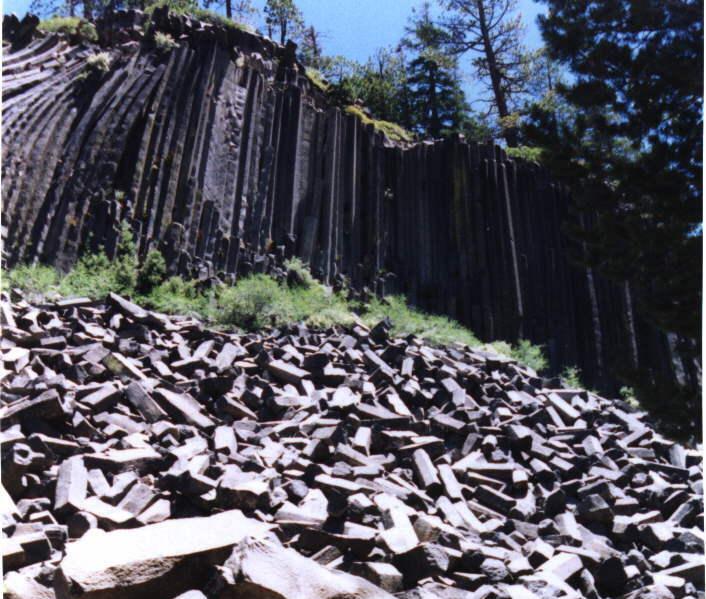 It's created from a large basaltic flow of lava that cooled just properly for tall standing columns be to be formed. The sides of the columns are incredibly flat and the columns stand straight and tall forming a unique looking cliff face. For this landmark to have been created, the conditions it was formed under had to be close to ideal. The ideal column would have sides at 120 degrees from each other, since this would reduce the most tension and stress. 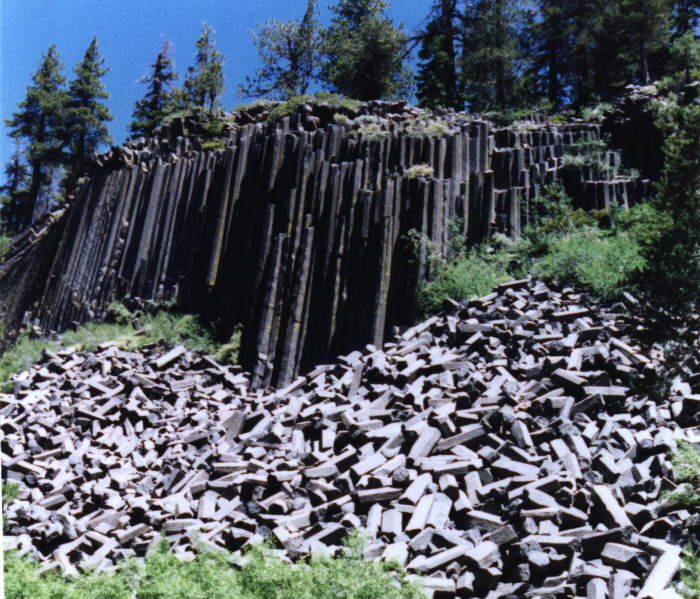 The top of the postpile looks shiny and glossy in some places from the polishing power of a glacier. 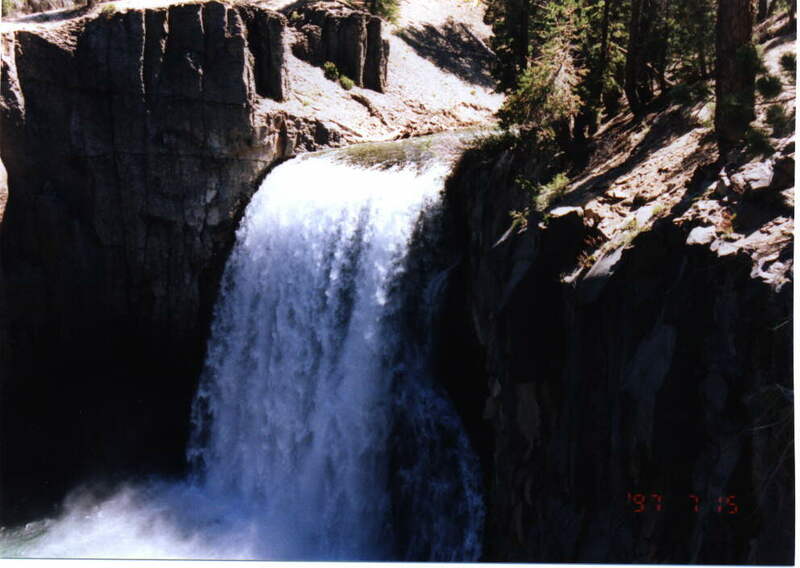 Rainbow Falls is another sight to see. 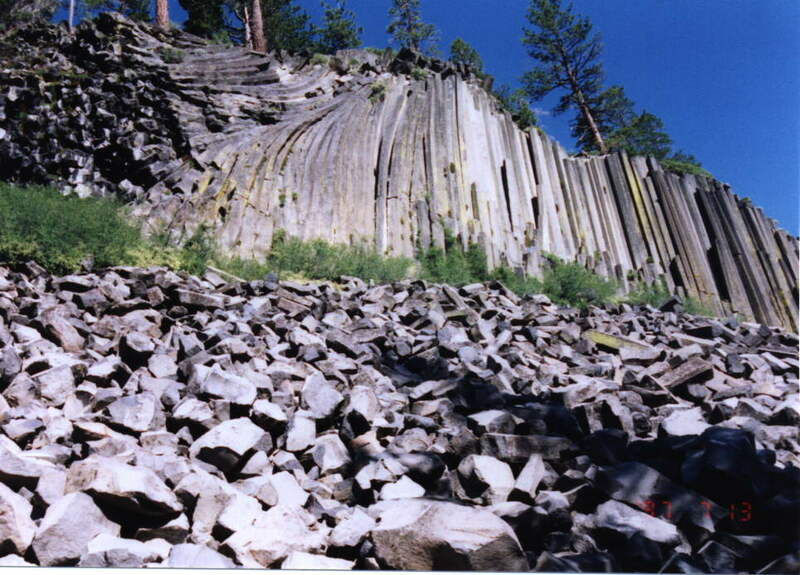 It's on the middle fork of the San Joaquin River and owes its existance to a particular type of lava flow. 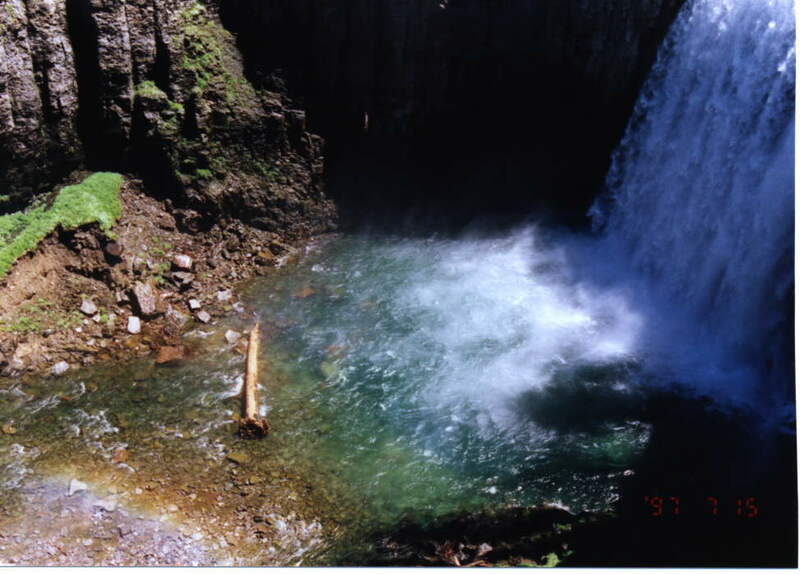 Rainbow Falls was created by the river shifting from one position to another, and then back again. When the river shifted back to its original position, it fell into its previous river bed. Through erosion, the waterfall backed up from its original position to its current position, where it has stabalized because of the volcanic rock that is resistant to the erosive forces of the river. The volcanic rock is plated horizontally allowing the river to eat underneath the cliff face, while not harming the position of the falls. 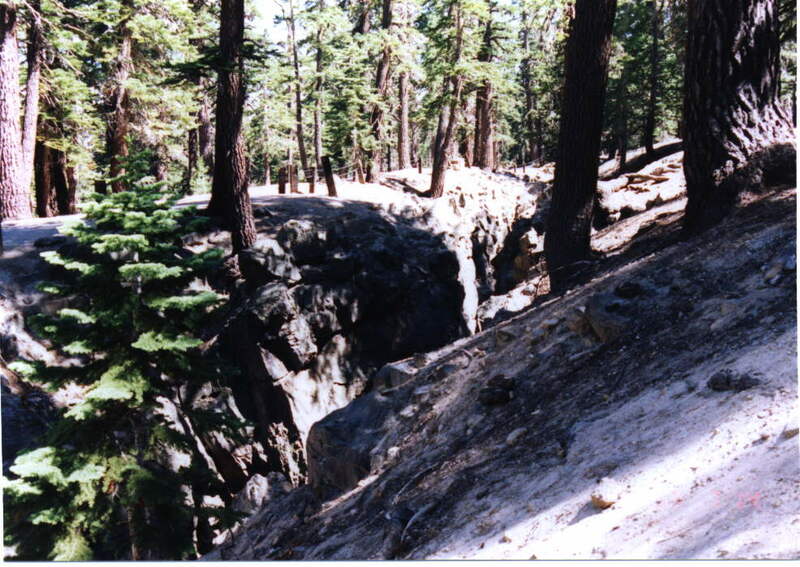 In the Inyo National Forest which surrounds Devils Postpile is Reds Meadow Campground. In the campground they had some "hot" showers which took the water from some natural hot springs. I took two showers (not in the same day) and that water was hot! (Not unbearable, just close to it.) This is a reminder that the Mammoth Lakes area is an actively volcanic area with plenty of hot springs. There is even a fissure that could have been caused by earthquakes, or by rapidly cooling lava, or both (there isn't a consensus on how it was created). 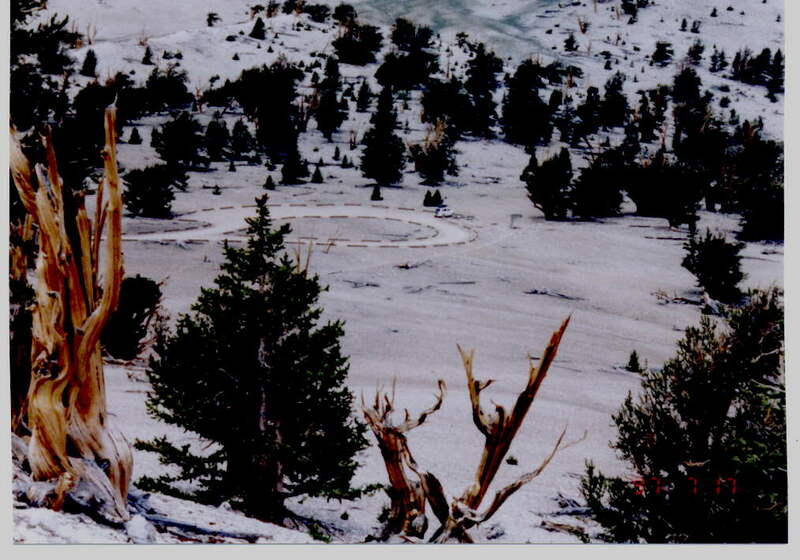 The Ancient Bristlecone Pine Forest is high in the White Mountains in the sub-alpine region. This is just before you get to the point where no trees grow at all. This park has the oldest known living tree, which is over 4,700 years old. What enables the trees to live for so long is that they have extremely dense rings (and wood) which is resistant to both weathering and disease. The tree also kills bark it cannot sustain to keep itself alive. At the highest grove of the park, you see both bristlecone pines and limber pines together. While the bristlecone pines grow tall and straight, most of the limber pines in the same area are low growing and bushy. 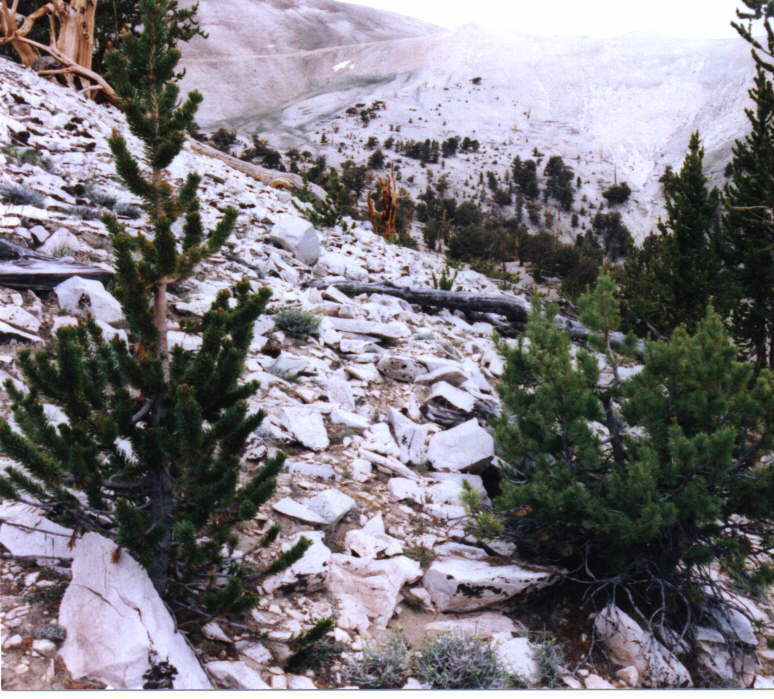 The brislecone pine in the park grow mostly around white dolomite shale (sedimentary rock). Most of the plants in the park cannot live well in the akaline soil created by the dolomite, reducing the bristlecone's competition for growth in those areas. 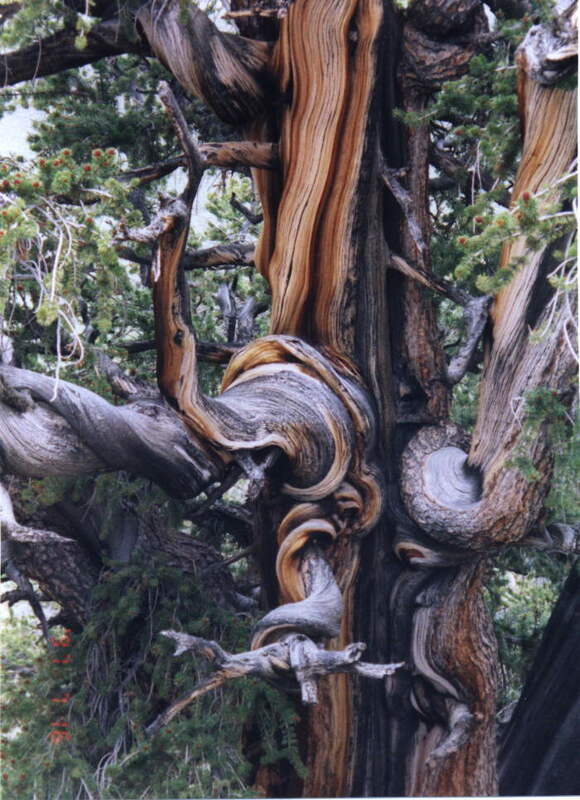 Bristlecone pine are closely related to the foxtail pine. My father for taking the majority of pictures. MammothWeb whose maps I'm borrowing until I scan my own better maps.